A carotid endarterectomy is an operation done to 'clean out' the carotid artery (the major artery of the neck which supplies the brain). It is used for patients with a tight narrowing of one or both of the carotid arteries which can cause a stroke if left untreated. The operation is performed via an incision in the neck and involves opening the artery, removal of the disease, and closure of the artery using a synthetic patch. Prior to carotid endarterectomy, accurate imaging of the neck arteries is required to plan for surgery. This will start with a duplex ultrasound, and is sometimes followed by a CT-angiogram (where dye is injected in to the blood at the time of the CT to reveal precise anatomy). A baseline set of blood tests will be done. Some patients require an echocardiogram (ultrasound of the heart). If Mr Milne has concerns about your anaesthetic, you will be seen by an anaesthetist before the operation for assessment and review of all test results. Unless otherwise specified, all regular medications are continued prior to the procedure. Mr Milne will give you specific instructions regarding anti-platelet medications (e.g. aspirin and clopidogrel), anti-coagulant medications (e.g. warfarin and Rivaroxaban), and any medications taken for diabetes. Bring a small suitcase with you to the hospital in preparation for a two night stay. An incision is made along the neck on the side of the disease carotid artery. The artery is carefully dissected. This involves dissection and mobilization of key structures including muscles, veins, and nerves. Clamps are selectively applied to the internal carotid artery (supplying the brain), the external carotid artery (supplying the face) and the common carotid artery (supplying both). This isolates the plaque (disease causing narrowing), and allows the artery to be opened along its length. A shunt (flexible bypass tube) is usually placed in to the common carotid artery below, and the internal carotid artery above, to allow blood to continue to flow to the brain whilst the clamps are applied. The plaque is then carefully pealed away from the artery, leaving behind a clean, wide artery with a smooth inner surface. A prosthetic material is sewn in to place as a 'patch' to close the artery. This ensures that the artery is not narrowed when closed, and prevents narrowing of the artery in the future. The shunt is removed and the vessels are thoroughly flushed to remove debris. The clamps are then released, restoring flow of blood through the vessel, and the artery checked for haemostasis. The incision is closed with layered sutures, and the skin is closed with a dissolvable stitch underneath the skin. A drain is left in the wound, and this is usually removed the next morning. You will be transferred to the vascular ward for monitoring after the procedure. You may eat and drink after 4 hours. On the first day after the procedure, you will be sore along the incision line in the neck. Pain relief will be given to minimise this. The following morning, the drain is usually removed, and you will be encouraged to sit out of bed and walk around the ward. The aim for discharge from hospital is on day two after the procedure. Occasionally, a longer stay is required if issues have arisen. The most common cause for delay is difficulty with blood pressure control, which needs to be managed prior to going home. You will be scheduled for a review appointment with Mr Milne 4 6 weeks after the procedure. A duplex ultrasound of the carotid arteries will be performed at the same visit. After this, you will be reviewed at 6 months and 12 months post-operatively. An ongoing annual check with an ultrasound is then required to monitor the side of the endarterectomy, but more importantly, to ensure the carotid artery on the other side doesn't cause problems. It is generally advised to wait at least 4 weeks before driving a motor-vehicle following carotid surgery. For safety, you should be able to move the neck freely when driving. If the reason for having a carotid endarterectomy was a stroke, your neurologist will advise when it is safe to return to driving. You may fly interstate after 4 weeks, and may fly internationally after 6 weeks. If flying, it is important to stay hydrated and walk around the cabin regularly. 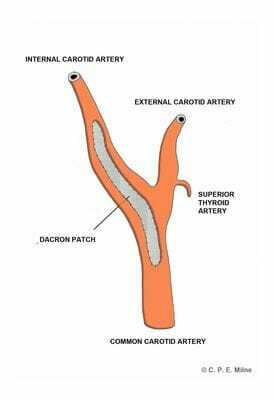 The aim of carotid endarterectomy is to prevent stroke. However, the operation on the artery itself carries with it a small risk of stroke. This risk is significantly smaller than the risk associated with not operating on the artery at all. The risk of stroke around the time of the operation is generally quoted at <3%. Data from the Australian national audit database over the last 5 years (>10000 operations) suggests the risk is less than this. It is normal to experience some pain and bruising along the neck wound. You will receive pain-relief medications through the drip initially, then orally. You will be sent home with medications for ongoing pain relief if required. Even when there is no bleeding at the time of operation, major bleeding can occur from the site of the operation. This is uncommon (<5%). If it occurs, it requires an urgent trip to theatre to fix. Antibiotics are given at the time of surgery to minimise the risk of infection. The risk of an infection involving the neck wound is ~1 %. This type of infection usually resolves with a course of oral antibiotics. The risk of infection involving the prosthetic patch used to close the artery is rare (<1%). If this occurs, the infected patch would likely need to be removed. These are complications that occur away from the site of the procedure. They are a risk to all patients undergoing major surgery of any kind under general anaesthetic. They include heart attack, kidney dysfunction, chest infection, clot in the legs (deep vein thrombosis - DVT) and clot in the lungs (pulmonary embolus - PE). If any of these occur, the majority of patients are successfully treated whilst an inpatient, although the length of hospital stay would likely be increased. The risk of dying from complications associated with carotid endarterectomy is rare (<1%). If you are considered a high-risk patient for surgery, this risk may be increased. Your individual risk will be discussed with you prior to surgery.